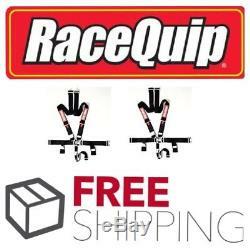 Brand New PAIR (2) of RaceQuip 5pt Latch & Link Racing Harnesses Color: Black, SFI 16.1 Certified & all Belts have Current Dates. Shoulders adjust from 20`` to 62`` and the lap belt adjusts from 20`` to 60``. All RaceQuip 711 series belts come as a ``pull down lap`` design, which means that the lap belts must be pulled down and away from the center latch & link buckle mechanism to tighten. All RaceQuip Latch & Link motorsports harness sets are distinguished by a pivoting ``hammer, `` called. Most Items Delivered in 3 Days or Less. See below for full details. All RaceQuip Latch & Link motorsports harness sets are distinguished by a pivoting ``hammer, `` called a Duckbill, which is located on the lap belt and locks all of the belts into place by snapping down into a detent. Both shoulder belts and the sub-belt are hooked over the link; the link is inserted into the latch on the lap belt; the Duckbill is then brought down into and over the link, securely holding all of the pieces in place. Since RaceQuip seat belt sets are ``double adjustable``, lengths are simply adjusted on either end for ease of installation. Using the included three bar slide you can mount the belts by either wrapping them around a rollbar or by bolting them in place with the supplied ends (bolts not included). NOTE: RaceQuip harness sets and seat belts are NOT D. / FMVSS 209/302 certified for on highway use. They are only to be used in racing vehicles off of public streets and highways. All racing harness sets are designed to be mounted in a racecar to a rollcage or harness bar - if you do not have either, you should not try to install any RaceQuip harness set or seat belts. 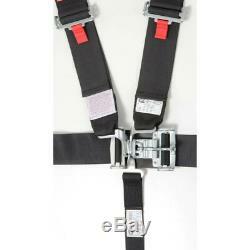 All SFI 16.1 rated RaceQuip harness sets can be re-webbed and re-certified upon expiration. Available in black, red, blue, yellow, purple, platinum, green, pink, and camo - one ``set`` of seat belts equals one seat. SFI 16.1 Rated (Tags Affixed). Size: 3`` Lap, 3`` Shoulder, 2`` Sub. / FMVSS Certified for On Highway Use. Pull Down Style Lap Belt. 5 Point Design - Single 2`` Crotch Strap. Double Adjustable for Ease of Installation. Wrap Around or Bolt-in Mounting. Shoulders Adjust from 20`` to 62``. 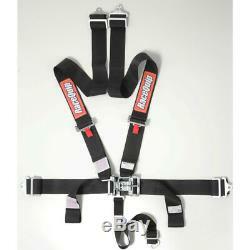 Lap Belt Adjusts 22`` to 60``. Can Be Re-webbed (SFI) Upon Expiration. As with any electronic item, additional installation parts may be required to complete installation. Please message us for details. All Sales final on Racing product once the item has been opened or wrapper removed. We want you to get your item FAST. For most orders placed Monday through Friday before 1pm EST we are able to get your order out the door that day. Your satisfaction is our top priority and we'll strive to make sure every customer is 100% satisfied. We are committed to providing you a quality product at the lowest prices possible. We also realize that the quality of the customer service we provide you plays hand and hand with the product you receive. We have been in the Consumer Electronics business for over 15 years and know what it takes to please our customers. We strongly encourage professional installation of any electronic devices. We are not responsible for any damage caused by improper installation. We are not responsible for any damage caused by defective products or loss of use, uninstall/reinstall charges that may be incurred due to defective products. By purchasing your product from us you agree to these terms and conditions with NO exceptions. Any defective item may be exchanged for the exact same item. Items without a return authorization number clearly marked on the outside of the package will be refused. We hope you feel comfortable with our policies, as we have done extensive market research and have continuously upgraded our policies to make our customers shopping experience the best it can possibly be. We do not allow local pick-ups or drop-offs. No third party billing offered. The item "Racequip Black 5 point Racing Harness Seat Belts 2 Pair Razor Rzr Drag Race IMCA" is in sale since Sunday, November 11, 2018. This item is in the category "eBay Motors\Parts & Accessories\Performance & Racing Parts\Safety Equipment\Safety Belts & Harnesses". The seller is "race_choice" and is located in White Plains, New York. This item can be shipped to United States, Canada, United Kingdom, Denmark, Romania, Slovakia, Bulgaria, Czech republic, Finland, Hungary, Latvia, Lithuania, Malta, Estonia, Australia, Greece, Portugal, Cyprus, Slovenia, Japan, China, Sweden, South Korea, Indonesia, Taiwan, South africa, Thailand, Belgium, France, Hong Kong, Ireland, Netherlands, Poland, Spain, Italy, Germany, Austria, Bahamas, Israel, Mexico, New Zealand, Philippines, Singapore, Switzerland, Norway, Saudi arabia, Ukraine, United arab emirates, Qatar, Kuwait, Bahrain, Croatia, Malaysia, Chile, Colombia, Costa rica, Dominican republic, Panama, Trinidad and tobago, Guatemala, El salvador, Honduras, Jamaica, Viet nam.